Please see https://www.eurofurence.org/EF25/hotel for a description of the room categories and their prices. UPDATE: Deluxe Rooms and Junior Suites are booked out! With the experiences made last year, we have worked with the hotel and made some adjustments. When you register for the convention, at first hotel booking will not be available yet. There is no longer any relation between your registration number and the time the booking functionality will become available for you. One week after public registration, on Saturday, January 19, 2019, at 07:00 CET (in the morning!) 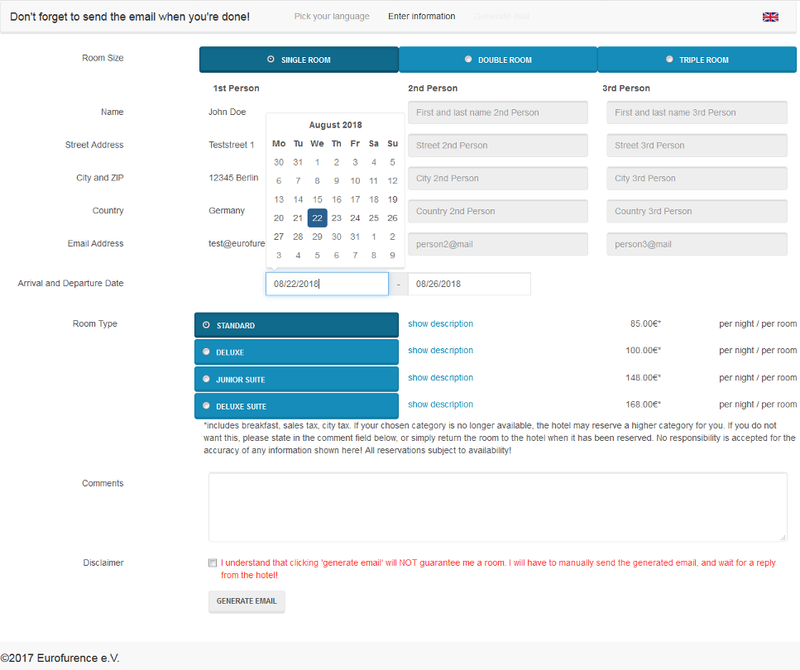 a large button will become available in the registration system at the bottom of the "How to Book a Room" page. You will need to be logged in to the registration system and select "How to Book a Room" from the green menu to the left. This button will take you to a web app in which you will need to enter some more information regarding your room partners and your booking preferences. 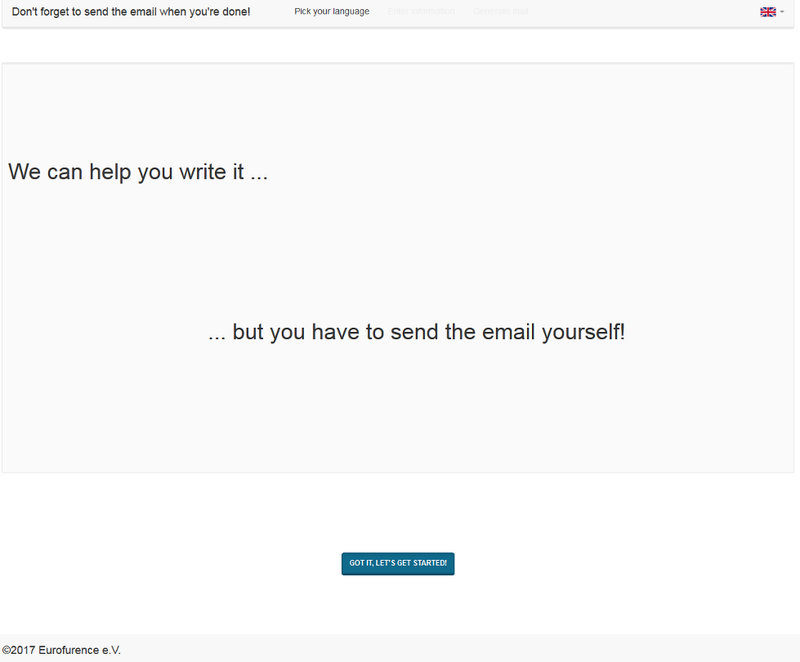 The app will help you generate an email, including a personalized code and a keyword. Now all you need to do is send that email to the hotel. The hotel will begin processing those emails on the same day, but as there will be a large number of inquiries we ask that you please wait until the following business day to inquire if you have not received a reply. While you will generally have a better chance for rooms to still be available if you send yours in right when booking has started, please be aware that there can be no guarantees that emails will be received and processed exactly in the order they are sent in. That effectively gives it a bit of a lottery element. Due to the asynchronous nature of email, it always had that element. All we are doing is stating it clearly this time. Important: You MUST use the web app to compose the email in order to gain access to your personalized code and the keyword. Emails that do not contain this information will not be processed by the hotel. Please make sure to copy&paste the subject as well. What happens if I write to the hotel directly, without generating the email using the web application? Your email will not include your personalized code and the keyword. The hotel will not let you book a room as you have not been able to demonstrate that you have a valid registration for our convention. Why 7am in the morning? The hotel reservation staff doesn't enjoy working through the night, and we are certain you would not be happy if you all had to wait until Monday morning for an answer. So this was the best available solution. Just set an alarm clock if you live in Europe, we will be doing the same. Or if you live in the US just stay up a little late. If you have further questions about this procedure, the thread at https://forum.eurofurence.org/index.php/topic,8412.0.html is a good place to ask them.